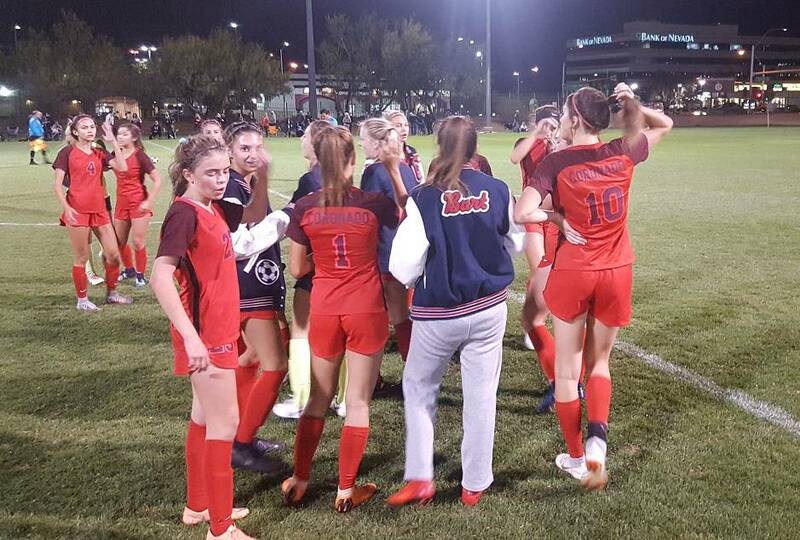 Alysa Caso scored two goals Thursday, including the game-winner with five minutes remaining, to lift Coronado past Desert Oasis, 3-2, in the Class 4A Mountain Region semifinals at Bettye Wilson Soccer Complex. When Coronado’s girls soccer team went to Bishop Gorman on Oct. 17, the Gaels celebrated senior night with a 7-0 win. But with coach Dana Neel resting several players, the score was clearly not indicative of the true matchup between what many believe are the area’s two best teams. Gorman defeated Foothill in the other semifinal, 6-1. Desert Oasis offered plenty of competition in the semifinals, as the Diamondbacks led late in the game. Desert Oasis trailed 1-0 at halftime, but got a penalty kick from Alex Houston and a 30-yard blast from Audrey Dunn to beat Coronado goalkeeper Taylor Book to give the Diamondbacks a 2-1 lead with 18 minutes to play. Coronado was able to pull even four minutes later and began putting the pressure on Desert Oasis goalkeeper Samantha Gato. But Gato was spectacular in turning away four shots in consecutive sequences that thwarted the Cougars’ efforts. It was a fifth sequence, however, that proved to be the dagger. After another big save by Gato, Caso was in the right spot in the midst of traffic in front of the net to deliver the winner with a header. Kaitlyn Kowalchuk also scored for Coronado, and Book had three saves. Even with the loss, Gato said she was proud of how her team defied the naysayers who believed the Diamondbacks would be a pushover against a perennial power like Coronado. Bishop Gorman 6, Foothill 1 — Jaden Terrana scored twice for the defending state champion Gaels, and Ashtyn Fink, Kevyn Hillegas, Jacqueline Hillegas and Kennedy Enus each added a goal. Terrana put the Gaels on the board early, when she knocked in a rebound past Falcons goalkeeper Felicity Reimann in the eighth minute. Fink broke free down the left side eight minutes later and powered a shot under Reimann. Kevyn Hillegas’ shot from just outside the 18-yard box found the top shelf in the right corner to make it 3-0 at the half. After Terrana added her second goal in the 46th minute, Brooke Vokoun scored the lone goal for the Falcons one minute later, cutting Gorman’s lead to 4-1. Enus and Jacqueline Hillegas tacked on goals to push the game out of reach. Gorman coach Doug Borgel said he wasn’t surprised one bit by the scrappiness from Foothill, as he was well aware of their talent, and how hungry they would come out considering a state tournament berth was on the line.